Room Dividers Provide Maximum Versatility Anywhere You Need To Divide Space! Did you know you can combine Screenflex Wallmount Room Dividers and Standard Room Dividers for maximum versatility in your gymnasium, fellowship hall or just about anywhere you need to divide space? Wallmount dividers are mounted to the wall and fold against the wall for storage. Your Wallmount room dividers can be extended in any direction to divide your space as desired. Dividers take up approximately 2’6″x 3′. Check with our design team to get the best option for your facility. Customers love that as they grow our room dividers have the ability to accommodate their growth. Tackable and sound absorbing divider panels can absorb up to 65% of sound! Tack, pin or staple artwork, lesson plans and more. Room divider panels provide an efficient way to display just about anything. Not sure which or what dividers will fit in your space? Our design team can prepare floor plans that are tailored just for your room. Receive 2-D and 3-D plans! 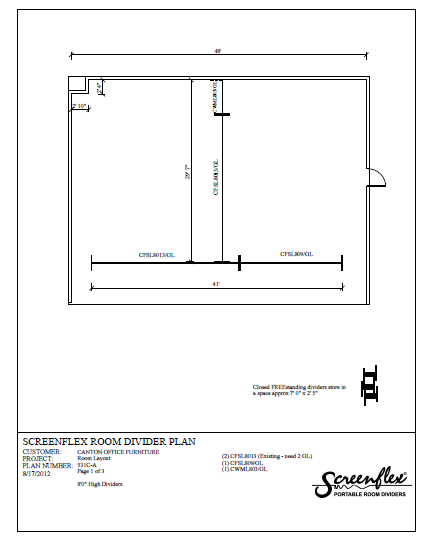 In the floor plan pictured, this customer purchased two 24’1″ long Standard Room Dividers a couple of years ago. They love the product, but wanted to expand the space due to a growing enrollment. The dividers have become a permanent solution, creating two rooms in the customer’s large gymnasium. To obtain the additional space they needed, one 3 panel Wallmount divider was installed and connected to the existing 24’1″ long Standard divider providing an additional 5’6″. 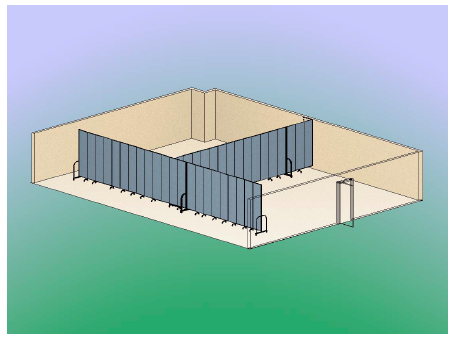 To create the bottom of the “T”, a 5 panel room divider is connected to the second 24′-1″ long Standard divider creating two 20′ x 30′ rooms. Our optional Multi-Unit Connectors keep the dividers fastened together to create longer lengths. Call or visit our website for more information regarding our free planning service. Flexible, Versatile, Economical…Screenflex Room Dividers! Can Room Dividers Expand My Space?